Great service and great quality means great business. I provide independent consultancy services to businesses within the hospitality and tourism sector. Maybe you have just run out of steam or need a fresh pair of eyes. Or need some helpful and constructive feedback on where your business can improve. I can work flexibly and provide either practical help or just the tools and knowledge to do it yourself. Or perhaps you are starting up a new business and need some ideas? I specialise in working with small food led businesses. Why wait to be memorable? My background - I was born on a farm in Suffolk and from an early age appreciated tasty, fresh food made from good quality and often home sourced ingredients - home reared beef, fresh milk, vegetables and home baking were regular treats. My grandfather was a Master Baker in Ixworth, Suffolk and both my parents very good cooks and I was encouraged to cook at an early age. Food has always played a massive part in my life and since leaving school I have continuously worked in the food and service industry. Berni Inns - I started my career here, they were not known for fine food, but were at the forefront for staff training manuals, slick service and value for money. I learnt very quickly about portion control and wearing the correct uniform. Private members clubs - I managed the Farmers Club in Bury St Edmunds in the late 1970's, ensuring the smooth running of the club under the direction of the house committee and with responsibility for the cooking of lunches, dinners and arranging special events. I also held the franchise for the catering concession at Bury St Edmunds Golf Club in the 1990's. Opening my own restaurant - I bought The Chalice Restaurant in the early 1980's and ran one of East Anglia's most popular vegetarian restaurants. We grew our own bean-shoots, made our own tofu and cooked everything from scratch. We were regularly reviewed by the national papers with a devoted and loyal customer base. Three children and 20 years later I returned to the same premises and served local meat and fish on a seasonal, monthly, modern British menu - ahead of its time in 2004. I sold the restaurant to the current owners of Pea Porridge who have taken the business to award winning level. Teaching and Assessing - NVQ Assessing brought me to teaching both front of house service and cookery at Further Education level at West Suffolk College. Here I continue to volunteer as a mentor to the current hospitality students. I also provide work experience placements for the local community college. I have taught adult education classes including Cook Your Way Round The World, One Pot Cookery, Cooking With Herbs, Learn to Preserve. Cooking on a Budget. Writing - I have created original recipes for publication including The Complete Book of Herbs by Lesley Bremness, the Chalice recipe books and currently write a regular recipe column for Herbs Magazine. 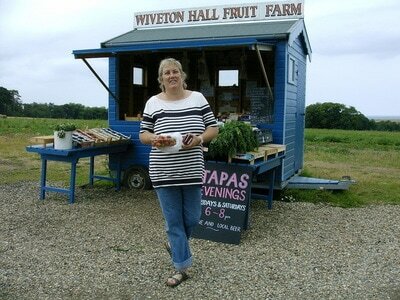 I am the co-author of the SuffolkFoodie website/food blog and regularly tweet, write and give talks about food. Hotel Inspector/Assessor and Consultancy - in 2008 I trained as an Hotel Inspector with Quality in Tourism where I worked for 7 years assessing properties within the quality star rating scheme, providing business support for a range of hotels, bed and breakfast businessess, self catering properties and specialising in food assessments for the Taste scheme. I continue to work as a freelance consultant to Visit England and the AA for whom I assess visitor attractions and motorway services. Mystery guest visits include the complete visitor journey ensuring that feedback will help improve the delivery of the perfect customer experience. I still live in Suffolk and love the countryside. Spare time is spent growing my own fruit and vegetables, learning about wine and searching for great food.